As festival season gets into full swing (and on cue the British heavens open! ), we prepare to don our wellies and enjoy those spine tingling, hands-in-the-air moments. But with more festivals to choose from than hippies at Glasto, it’s always good to have a go-to guide to get you seamlessly through the season. Phestival.co.uk offers just this. Their Blog is teaming with up to the minute festival news, while their festival guide offers information on festivals of all sizes, at home and abroad. With almost 5000 ‘likes’ on Facebook and a growing Twitter following, it is easy to see that Phestival is up there with the best in its kind. We have worked alongside Phestival since their humble beginnings as festival photographers. 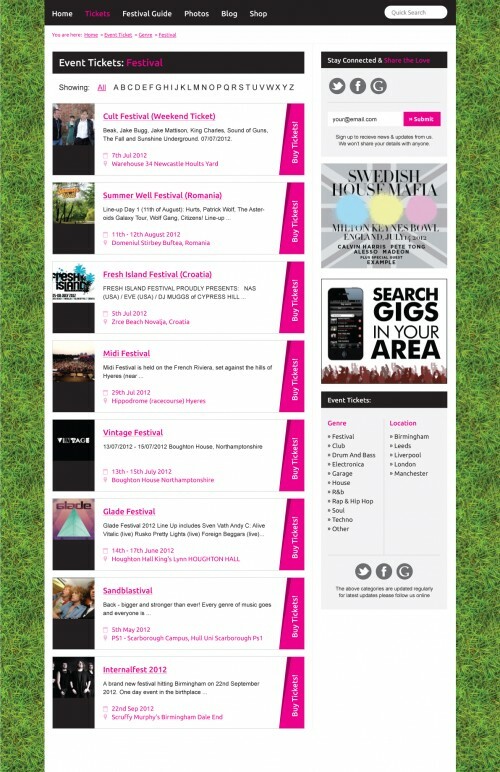 We are now pleased to be working on the relaunch of their festival focused website to include festival ticket buying and improved festival guide on the fully integrated content management system. To keep up to date with all the latest Phestival news, blog updates and competitions you can follow them on Twitter or find them on Facebook. For all your ticket buying, festival guide, or to check out the latest photos please visit the igoo designed website www.phestival.co.uk.